PARENTS of an eight-year-old girl who almost died last December received an “an unexpected blessing” from a Catholic high school last month. Lourdes Hill College, Hawthorne L’Arche and Disability Outreach service group captain Laura Ricca read Gabby Caldwell’s profile on the Developing Foundation website and was inspired to make a difference. “For us, taking an hour out of our day to raise money for someone, it’s only a week out of our lives, but for the Caldwells, its every day,” Miss Ricca said. Miss Ricca invited Gabby, who has a rare form of epilepsy, and mother Johanna Caldwell to share Gabby’s miracle story at a school assembly. “All the girls saw Gabby on assembly and they were really touched and just wanted to help her fulfil her life, and God’s plan for her,” Miss Ricca said. 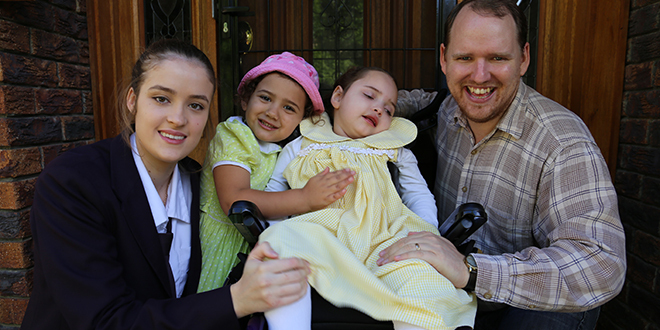 The school community, with the support of local businesses, raised $3000 for the Caldwell family, much needed funds that will go towards Gabby’s expensive speech therapy and physiotherapy. Gabby’s father Kevin Caldwell said he and his wife had worked tirelessly to raise money for her expensive therapies. “It was one of those things where we had done a lot of fundraising efforts and it got to the point where we were exhausted,” Mr Caldwell said. Their prayers were answered when Miss Ricca shared her desire to raise money for the family. “I was absolutely amazed,” Mr Caldwell said. “It was an unexpected blessing. When Gabby was only four months old, she started having seizures every couple of months. At two she was diagnosed with dravet syndrome, a rare form of epilepsy that begins at infancy. In December 2009, Gabby contracted gastroenteritis, which resulted in seizures lasting four days. This “cluster of seizures” left her with a severe brain injury that has left her unable to walk, talk or eat without assisted therapy. Gabby is Kevin and Johanna’s first child, and was “very much anticipated and appreciated” by the couple, who had tried to have children for eight years. Gabby’s birth is one of numerous miracles for the Caldwell family, who almost lost their first-born after a surgery that resulted in heart failure last year. “I thank God for every day we have Gabby,” Mr Caldwell said. “It came very close there in December. “Staff at intensive care didn’t think she would make it through. Read more about Gabby’s story.